LibraryThing account on December 18, 2006, which is quite early in my LibraryThing account history, so I've owned it for at least 8 years, if not more. In the many shelf purges that have occurred since then, I never got rid of Flewelling's books because she is rated so highly by fantasy fans. And, for me, winter is the perfect time for a quality epic fantasy novel. I love to become immersed in the worlds and the cultures and the struggle of good vs. evil. So when I saw that Luck in the Shadows was available for download as an audiobook, I decided it was finally time for me to read it. I was nervous that my tastes had changed too much for me to enjoy this one still, but that was not true at all. While I don't read epic fantasy as much as I used to, I still love authors who thoughtfully develop strong, multi-dimensional characters who live in rich, developed worlds. Lynn Flewelling does both those things, and she reminded me of why I love fantasy writing so much. The customs and cultures and religions and folklore that she brought to life here all pulled me completely into the story and kept my attention the whole way through. 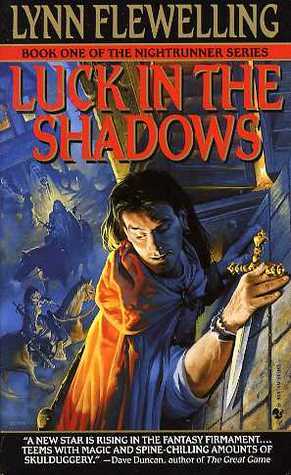 The story centers on two characters, Alec and Seregil. They meet in prison, escape together, and then get along so well that Seregil makes Alec his apprentice (though Alec is vague on the details of what exactly Seregil does). The two set off for adventures in distant lands, steal something that looks pretty small but ends up causing them a lot of trouble (a la The Hobbit), and then spend a lot of time trying to understand why that thing is so important and trying to solve a big political mystery. Along the way, readers meet many other wonderful characters, such as Micum and Nysander, two of Seregil's closest friends and advisors. We also get to explore a beautiful, multi-faceted world. One of my absolute favorite things about this story was the way Flewelling weaves so many things that are important to me. For instance, Seregil's country is led by women, and this seems completely natural to him. Women fill many roles, from military adviser to queen to innkeeper to wizard to traitor, and they fill all of those roles well. This is so rare in fantasy novels, and I appreciated it so much. While none of the main characters is female in this book (bummer), the world is very much one in which both sexes have power and respect. I think it's due to that fact that the romantic relationships are also more fluid in Flewelling's world. Alec and Seregil are great friends but you can see how that friendship will develop deeper into romance in the future. The red light district in town appeals to people of all tastes equally. I loved that Flewelling made a point of stating that the houses catered to both men and women, and to people who preferred both men and women. I loved so many, many things about this book. It truly is exactly the sort of fantasy novel that I've always loved and will continue to seek out. To give fair warning, Luck in the Shadows is the first book in a duology and it ends rather abruptly. Luckily, the book was published in the 1990s, so you need not be frustrated for long. Enjoy! I rarely, if ever, read any fantasy but this one sounds cery appealing to me. I like that women are on equal footing with men as far as the rolls they play And I love that there is an adventure or quest. Yay! I don't read epic fantasy very often at all, but I remain quite fond of Lynn Flewelling. I think this series drags on a bit too long, but the first three are all really, really solid. I definitely though this series was a duology. And now I realize that it actually is a series of six books. I am not sure how I was so completely off! Maybe because I only own the first two books :-) I am listening to the second one now and have the third one on tap. So can be halfway through quickly, at least! I read this ages ago and it just didn't click. I kept it, though, because I always felt like it was a mood thing and I need to try again... One day I will!